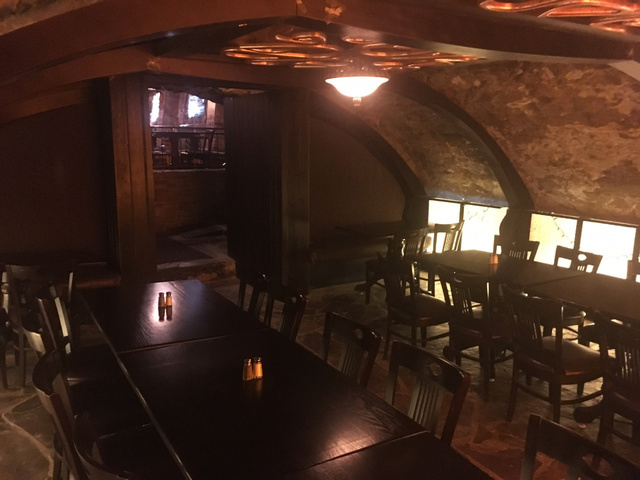 Since the The Lion Brewery Restaurant first opened in 1986 we have completed a couple of major restorations, including the excavation of the buried malted grains room (The Malt Toom) and the Cavern Wine cellar (The Cavern Aging Room). The Malt Room was used in the 1800's as part of the Brewing process. This room had floor to ceiling stone and iron malting equipment which was used to malt the grains. The malted grains were then used in the primary part of the brewing process. The malted grains are cooked until a malt consistency is achieved; the mash is then separated from the malt. Hops are then added to the malt and cooked for about an hour - the entire brewing process can take up to 8 hours from start to finish. The malt room was filled in with 3 floors of brick from the above building that was condemned after the original brewery was shut down. The Adlys family excavated the malt room that was filled in over 100 years ago, and then restored old arches, and cleaned the old stone walls and floors. Banquettes and booths were built out of old world cedar and stained to create a comfortable room to admire while dining. The ceiling has also been clad with cedar and stained to warm up the 12' high ceilings. The arched glass cabinets were custom made and used to display some of the old antique artifacts that came from the Huether Hotel and Lion Brewery of the 1800's. The room is now used for dining. 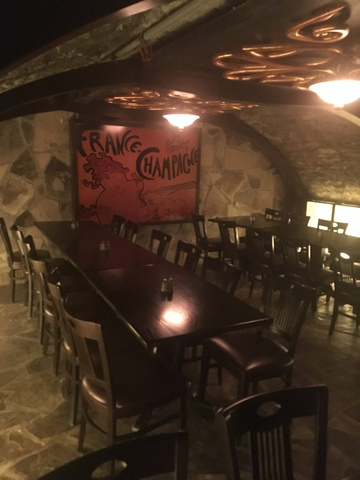 Small and large groups can be book The Malt Room for private functions up to 40 people. In this room there are 2 TV's and background house music can be set for your comfort level. Food can be ordered from the Lion Brewery Restaurant menu or from our catering menu. There are many food options to choose from or if you have a special request we can create a custom meal to fit your needs and budget. If you are in need of a birthday cake we have an in-house baker that can satisfy your tastes; our European baker makes a butter cream icing to die for. We can accommodate requests to bring in your own cake; there is a cutting fee of a dollar per person. The room is available 7 days a week during the regular hours of operations of the Lion Brewery Restaurant, 11:30am - 1am. The Cavern Aging Room was used in the early 1800's to age beer; because there was no refrigeration it would take 6 months to age beer. Today we age beer in 7 - 10 days. This room was dug out by hand by Kelly and David Adlys in 1985. The blocked in door was knocked down and 5 gallon pails - 2 at a time - were used to carry out dirt and rock for transport to the local land fill sight in the back of a pick up truck. It took months to dig this out. 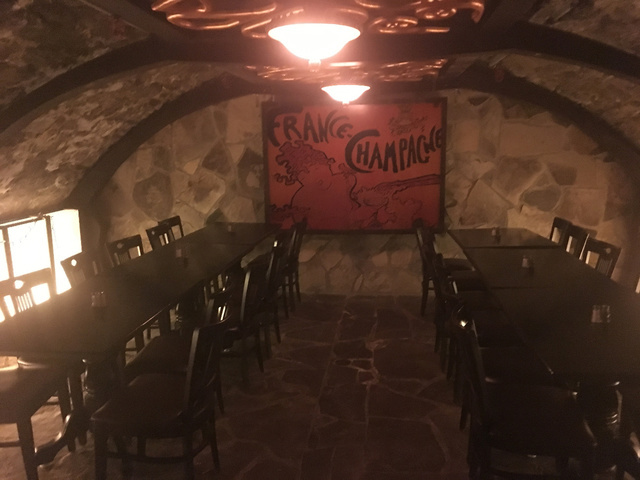 The room is located in the lower level of the Lion Brewery Restaurant beneath the back parking lot. It is below the frost line which is a constant temperature of 52 degrees, which was important for aging beer. 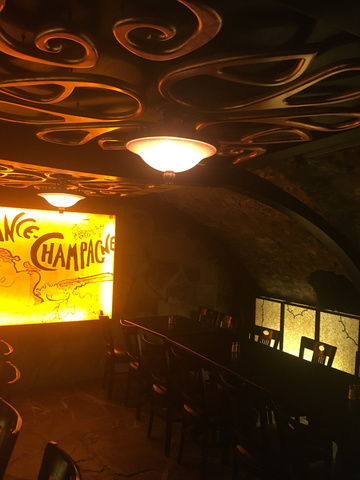 The Cavern was constructed with stone over 24" in an arch design with no pressure points. This is known to be one of the strongest structures built. 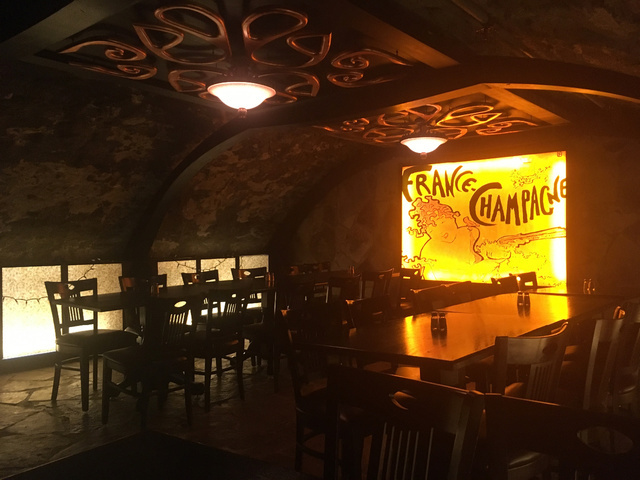 The Cavern Aging Room has been restored and renovated with arched accented wood pieces that follow the arched ceiling. There is cabinetry, upholstered high back booths, and dark stain is used to give the old world room its warm atmosphere. The room can be used for private functions up to 32 people. There is background music and no TV's. This room is ideal for birthdays, retirement parties, corporate functions, baby showers or just large group gatherings. Your group can order off the menu or arranged food options such as plated dinners or cold and hot buffets. View our catering menu for the food options that we have to offer. If you need something custom for your function, we can offer suggestions and and provide pricing. 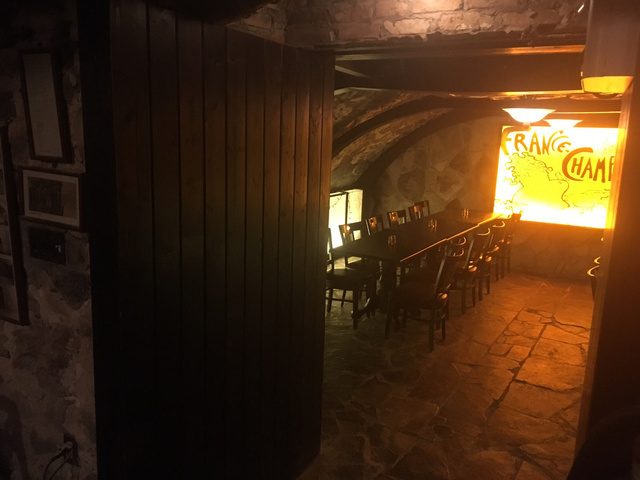 The Cavern Aging Room is available 7 days a week from 11 am - 1 am. There is no charge to use the space; reservations require only a credit card to hold the room. To make a reservation please call the Huether Hotel, ask for the Lion Brewery Restaurant and make a reference to The Cavern. 519-886-3350. Our selection of locally raised Canadian AAA beef. We support Ontario Farmers. 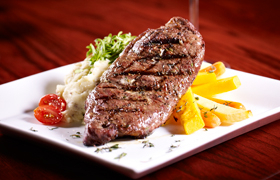 Our steaks are aged a minimum 28 days. © Copyright 2015 Huether Hotel. All Rights Reserved. Web Design and Content Management by REM Web Solutions.